We follow a statistically proven edge. It really does not matter how many trades you lose. What matters is how many winning trades you let run. Any system that relies on higher %age win will eventually fail. That is because the probability of any Technical Study, Setup in the "long run" is only 50%. When we trade any setup we have 50% chance of Success. So how do we make money? We make money by minimising our negative trades and milking the winning trades. But unfortunately the human nature of "Survival Mechanism" back fires in trading environment. It is responsible for keeping us safe and alive on this planet or the universe but sadly in trading it does the opposite. 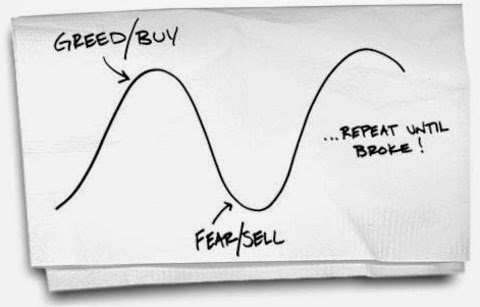 When we trade a setup and market moves the opposite way, our mind starts using a Feeling that is very useful and vital to our "Psychological and Emotional Health". The "Hoping Mechanism" activates thoughts of Staying Positive, Expect the Best, Its all going to be fine, Its going to turn around,". These thoughts and feelings are not required at this stage. This is mechanism is in our left brain. We undergo this phase just before getting in to a trade. It activates when we sense there is an opportunity. The mind interprets this as a danger. It does so by retrieving information from its database matching it with similar "past occurrences". It activates thoughts of, "What if its a loser?, I don't want to have another loser, I've had too many losers, Is it going to work? The system is not working and don't know what to do? The last time I traded around 3pm it went the other way? I don't know what's going to happen? The left brain is the concious part of our brain. Unfortunately it hates "unpredictability". It cannot deal with situations where the outcome is uncertain or low probability. Since 50% is not a high probability occurrence we feel this uneasy, unpleasant situation. When in Profit it activates, " Protect your gains before they vanish" , "What if it turns around and you end up losing and give back all this profit", "best to take the most out of it" " have enough profit now lets bail". This list is just the beginning. it comes in many forms and manifestations. If we let the human survival mechanism take charge and let it run on Auto we are going to end up where the rest of the 95% traders end up. This is counter productive in trading. What do we do? How do we get rid or at least press the "Pause" button for our Survival Mechanism while we trade. We certainly cannot afford to get rid of this system entirely. Because our ordinary life depends on this but not so much in this modern world. This discussion is beyond the scope of this post. The answer is to do exactly the opposite. When in a trade that goes the other way, we exit quick and when in a trade that makes profit let it run. We would use our minds internal mechanism by learning to activate responses manually. Dont let your mind;/brain run on Auto. Take charge. This is what Stephen R Covey calls Habit 1"Be Proactive.". 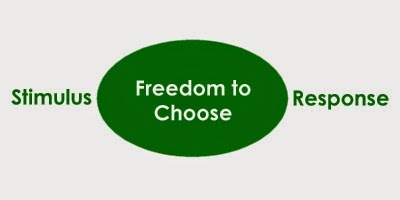 "Between Stimulus and Response is your Freedom to Choose" ....Stephen R Covey. When in a trade and price does not breakout properly and is approaching your exit point, reject the hoping and pampering thoughts. You cannot reject a feeling without replacing it with another. Remember you must have at least one feeling/thought at a given moment. So we accept Fear. Use fear to your advantage. Get scared and exit according to your exit signal. The predefined exit point you chose before entry or if it has changed during the progression of the trade then follow that exit spot. Brave people do not have fear? Absolutely wrong. They know how to deal with Fear. Its like saying that a black smith is not scared of Fire. Or a soldier is not scared of death or a bullet. Oh yes he is. He is, more than we are. Because he knows alot more about it than us. But he knows how to deal with it. So learn to deal with your fear. and then use it to your advantage. So DO NOT BE BRAVE when price says EXIT HERE with LOSS. Be Brave to Accept Fear and get out. On the contrary when price goes your way Reject the Fear and in place of Fear Activate/Accept the Hope Mechanism. Let it run and hope for the best. and when the system generates an exit signal that means Exit with Profit then Exit immediately. Here is another treat for you. As soon as you are about to exit with profit the left brain does its final "what it thinks is a favour to you" Trick. It does that by presenting to you the "Hope Mechanism" one more time. It says stay in a bit longer its going fine. Remember last time, you exited to soon. What if it continues. Reject that and accept the system generated exit signal. By not following this profit taking exit signal your actions are motivated with "Greed". It is evident that we cannot get rid of feelings of "Fear, Greed, Fearlessness or Bravado, and Hope". These are parts of our structure. These things are a Fact and they will not cease to exist as long as the human mind exist. Our job is to learn to use them appropriately, not to get rid of them. Trade what you See not what you Think.